The Barn Door mount gets it's name from the fact that it's basically a wooden board with a door hinge. 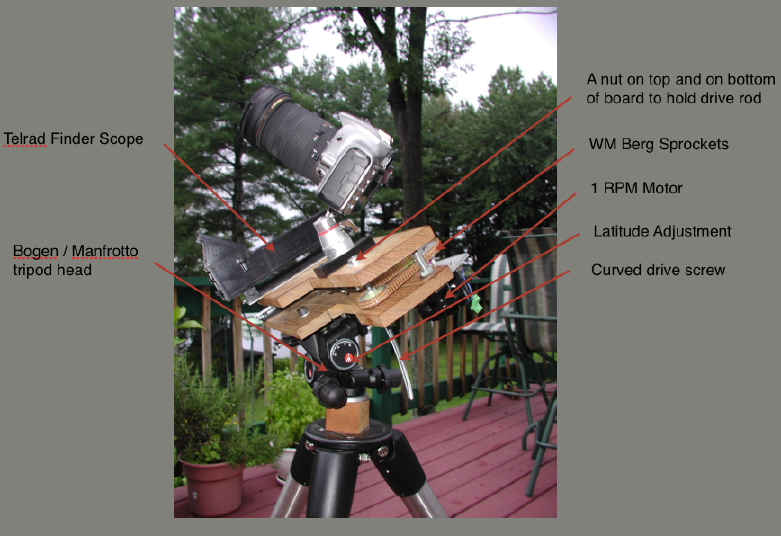 While there are many commercial mounts to track the sky, here we will discuss a simple way to construct a mount that will costs less than $100 complete with a motor to drive the screw. 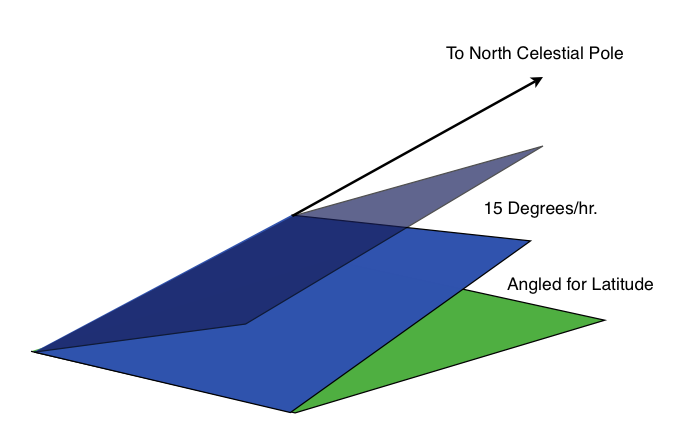 The mount must turn at exactly the speed of the rotation of the earth but in the opposite direction, so the stars appear stationary. 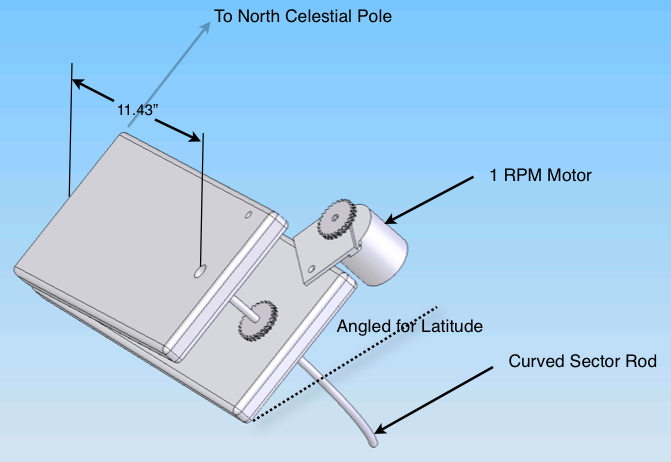 The mount also must be angled for the users given latitude. There are several designs floating around on the internet. This design is called a curved sector drive, because the threaded rod it uses is curved. The curved sector drive allow for a constant drive rate, therefore making this design simpler to use with a motor. 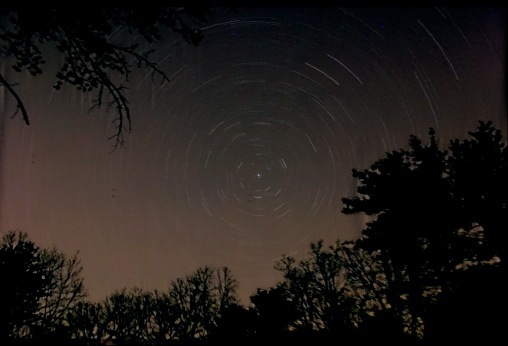 The movement of the sky is one continuous movement around a fixed point, the North Celestial Pole. Since we know the Earth rotates once per day, which means one full 360° in ~24 hours. This translates to about 15° per hour (360/24=15) or 1/4° per minute (360/24/60=.25). This is called Sidereal time. The sky moves in a near perfect arc around one single axis. If we angle the 2 hinged boards for our given latitude and we move the boards at a constant rate of 15/hour we can now track the sky very accurately. Using some basic math we need to calculate diameter the worm gear. Assuming we would like the drive nut to turn once per minute and we use a 1/4-20 thread rod for the curved sector drive. We know that there are 23 hours 56 minutes in a sidereal day (1436 minutes), so now we can calculate the gear diameter. Now we have the distance from the hinge to the curved sector drive to be 11.43 inches. The next task is to bend the threaded rod to match the 11.43" radius so that the mount will track correctly as the barn door mount is rotated about it's hinge. Using a piece of plywood large enough to layout a 11.43 radius using a compass, scribe the radius onto the plywood. Then using some screws, place the screws every 4" or so on the inside of the arc. You need the center line of the 1/4-20 threaded rod to match the 11.43 inch arc as closely as possible. The length of the 1/4-20 threaded rod will determine the length of time you can image for without having to rewinding the mount. 8 to 12 inches seems to work well. 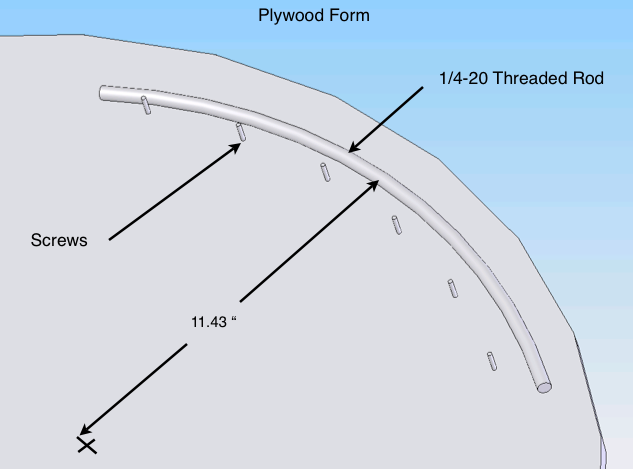 Start out using the full length purchased of the 1/4-20 thread rod, typically they come in 24 to 36 inch lengths. Work the length around the form The longer length is easier to form and work with. Once the rod is the best you can get, then cut out the best part of the sector matching desired radius on the plywood. Now all we have to do is cut two boards and drill a few holes and attach the hinge. You can use any boards but a hardwood might be a bit more stable. I used some Teak that I already had. The boards should be 3 to 5 inches wide and about 12.5 inches long. By adding a 1 RPM motor from Edmund Scientific and two sprockets from WM Berg the tracking process can even be automated! For alignment on the pole, you can go to a lot of work to put in some sort of pointer, but any error in installing it relative to the rotational axis of the hinge adds to the overall pointing error. 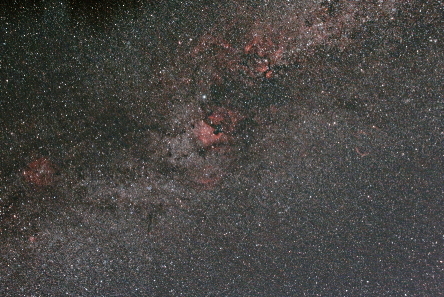 Just sight up along the hinge to Polaris seems accurate enough for a start. I do have a Telrad 4 degree finder scope mounted to mine. 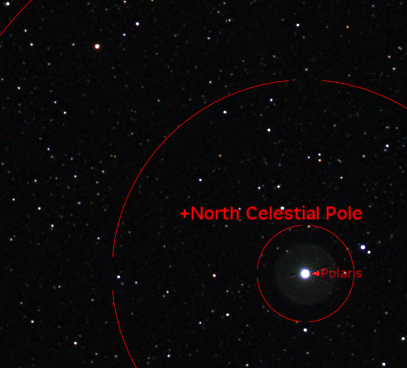 Below is what it looks like through the finder scope, as you can see the NCP is about 0.75 degrees from Polaris. Once I have located Polaris in the center then I move the center to the NCP based on the date/time , I use Starry Night for this.